The real victim of the shutdown. 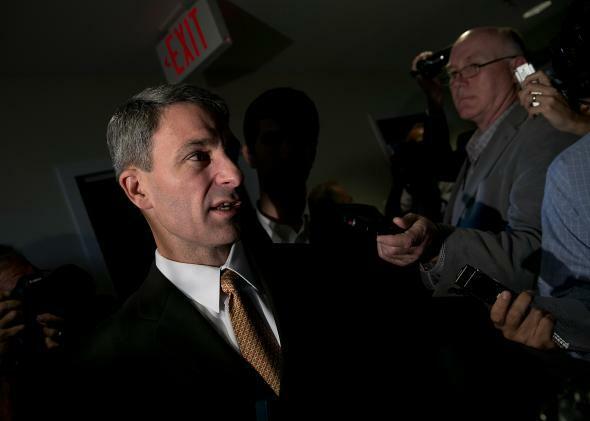 Nora Caplan-Bricker writes that Virginia gubernatorial candidate Ken Cuccinelli may suffer if the government shuts down and voters in the D.C. suburbs blame Republicans. Strike that—when they blame Republicans. * This came up in the debate with Democratic candidate Terry McAuliffe, which I covered on Wednesday. Asked about a possible shutdown, Cuccinelli pivoted and argued that McAuliffe was actually more likely to stir a crisis. I want to tell you is that this is not the kind of thing that you’d see happen in a Cuccinelli governorship, as we put together a Virginia budget. But 10 days ago—11 days ago, last weekend, my opponent repeatedly said that he wouldn’t sign a Virginia budget that didn’t have the Medicaid expansion in it … I understand that. But it is not the be all and end all of Virginia budgets, particularly if you’re willing to shut down Virginia government just to get the Medicaid expansion, which he said repeatedly he won’t sign a budget without Medicaid expansion in it. Now I disagree with him on Medicaid expansion. But this is not an appropriate tactic for Virginia. This is a Washington tactic. And if you like the way Washington works, you will like a Governor McAuliffe. The answer didn’t make it into many after-action reports on the debate, possibly because it was completely unconvincing. Washington is hurtling toward two crises, and I agree with my colleague Matt Yglesias that a government shutdown (if the CR doesn’t pass) is less threatening than a debt default or market panic (if the debt limit isn’t hiked). Virginia doesn’t have a debt limit that needs to be raised by acts of the legislature. So the idea that McAuliffe would hold Virginia hostage in order get the Medicaid expansion revealed just how worried Cuccinelli was about this impression of hostage-taking Republicans. Here’s his problem: Even if the government doesn’t shut down, Congress will spend most of October arguing about the debt limit. (It needs to be raised by Oct. 17, according to the Treasury.) Virginia voters will be hearing about the governor’s race maybe only slightly more than they hear about Virginia’s own Eric Cantor negotiating on the debt limit. Sure, according to polls, the Republican position that the debt limit may only be raised if spending is cut is pretty popular. Oops—as of this week, that’s no longer the Republican position. Republicans are asking the debt limit to be hiked only if Obamacare implementation is delayed, Keystone XL is approved, EPA coal regulations are halted, etc., and etc. This is just a rotten atmosphere for Cuccinelli. In the debate, he struggled to explain why he wanted the government to be funded without dissing Ted Cruz. How does he finesse the debt limit? *It’s a role reversal from 2009, an election that happened as an increasingly unpopular Democratic Congress was pushing for a vote on the embryonic-but-still-unpopular Affordable Care Act. The vote in the House happened only days after Bob McDonnell won the governor’s race in a landslide.